I’ve made mistakes. You’ve made mistakes. We’ve all made mistakes. What was the last mistake you made and how did you work through it? Did you point fingers? Push the blame to someone else? Or, did you set aside your pride and take full responsibility? The way you handle an issue or a mistake is a direct reflection on you and your self-brand. The same is applied to companies and their brands. With the damage one bad review can do, risk management is an important part of your brand messaging. Throughout the decades, consumers have had the opportunity to observe how brands navigate PR crises. In recent years, however, consumers have been able to participate and influence the conversation around a crisis; they will call out an apology that is disingenuous or applaud brands on their humility and sincerity. 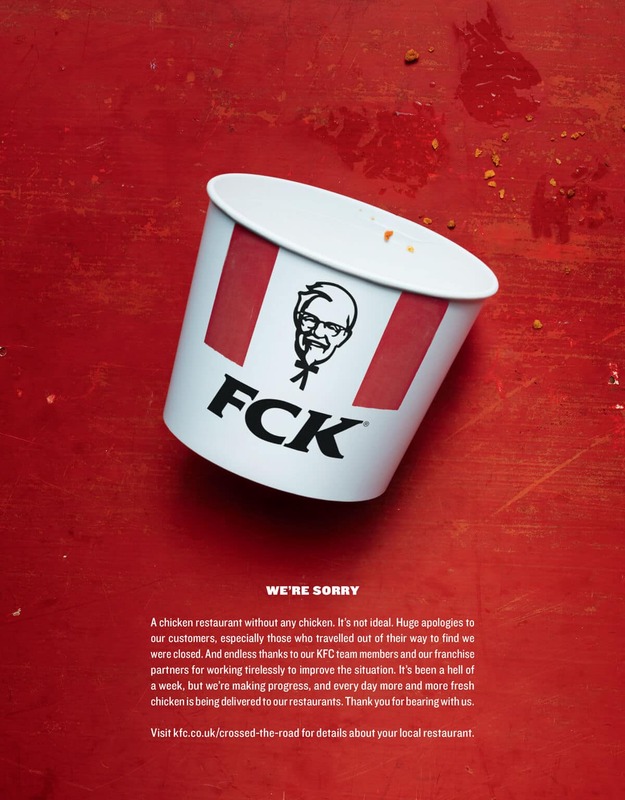 A recent example I’d like to discuss is (UK’s) KFC apology for its chicken shortage crisis. It was drama. Chaos. Families showed up to KFC’s that had closed shop overnight. Locations that remained open did not have chicken items on their menu. You can imagine the outrage of traveling a distance to eat chicken from a chicken restaurant, that doesn’t have chicken. Instead of pointing fingers to their UK distributors and farmers, they came up with an unforgettable apology note to its costumers. And, it worked! It worked so well it became the apology note read around the world. People took to Twitter, praising the company and accepting their apology. Now that is some finger lickin’ risk management. No one is perfect. No brand is perfect. Though one mistake or mess-up may seem like the end of the world, it’s not. Humans have the amazing quality of forgiving and moving on. It might take some longer to forgive and move on, but one way to assure that they will is to say two magical words: I’m sorry. KFC did that, and it saved their brand and reputation. Good job, KFC. Good job. This entry was posted in Brand, Commercials & Advertisements and tagged kfc, risk management. Bookmark the permalink.